You can relive those emotions now! The C’mon tour we’ve embarked on while you’ve been supporting us is finally out on DVD! It has been a tour where I could reassure myself of the bond between us and our fans. Please also enjoy watching it at home. 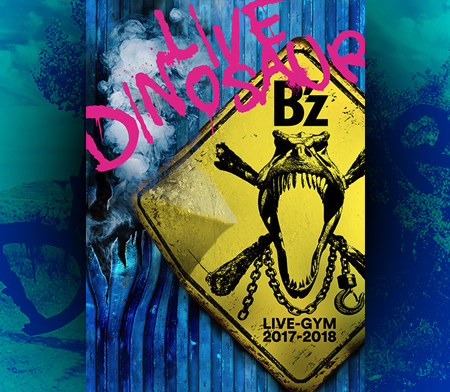 Just got the blu-ray yesterday and watched it…I have a feeling that B’z’s energy is draining….they are putting in way too many ballads in the set (not the best ballads at that.. where’s 消えない虹 [Kienai Niji]?? )… and they don’t run around as much as before .. they also talked quite a LOT during the set..Also they seemed to have use the same stage as before (watch the middle bit and u know what i am talking about). Still, great that they played calling and itsukano merry christmas! 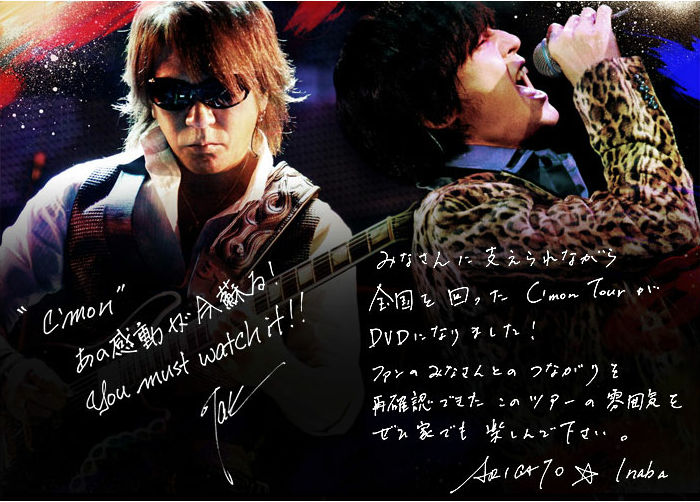 Although it seems that I am bashing that I am not.. just slightly disappointed with C’mon and the follow up to ain’t no magic cos ain’t no magic is a pretty good album for “post-Eleven” B’z …Any high def B’z footage is treasured of course! Can’t wait for their 25th Anniversary tour!!! Despite I haven’t watched the concert yet, I was able to find a 10-minute summary to bridge the time. Therefore, I have to be careful as to voice an opinion on the concert, but unfortunately, my impression tends to the same direction as Gordon’s. No doubt, I will enjoy the concert, but—I think you have to be honest—it is obvious that even Koshi and Tak aren’t immune to aging and the “C’mon” tour shows that this fact cannot be hidden forever. That they don’t run across the whole stage is not what’s thought-provoking for me, though—I don’t think you still have to do it at the age of 47 or 50, and I don’t believe that would be a reason for anyone to quit their support. No, it’s rather Koshi’s voice which makes me write these lines. After all those years of giving that dynamic and challenging performances, it is no miracle to me that certain wear marks simply have to appear at some time. I don’t like saying that, but just as Koshi had apparent difficulties at the end of last year’s Los Angeles LIVE-GYM (which I had thought also resulted from the miserable acoustic in that theatre), the extracts of ZERO, ザ・マイスター, and, above all, C’mon make me rather think about the condition of Koshi’s voice than enjoying the performance. Anyway, this is just a surface impression. Before I continue giving thoughts to this matter, I should first watch the whole concert. Agree with Christian above. I will still support them no matter what. Maybe I just find it sad that I will never be able to watch them live in their prime (I’ve never been to their live performances, only watched them on dvd). Your comment on koshi’s voice is particularly true. There are some notes that appears to be quite wobbly now. I seriously suggest Tak to write songs now to accommodate this. If you notice from the older records, off the lock up to part of Run and Loose, some songs are written in lower keys but I understand that after loose both Tak and Koshi have found a “sweet spot” for Koshi to sing in.. you can note that Koshi’s voice sounds best at a moderately high pitch even starting from the verse. Given this situation, I sincerely hope they will start doing some more songs back from the past, like 消えない虹 (hahha yes i’ve been petitioning them to do this song for long) or キレイな愛じゃなくて. These both songs I think are songs written at a time where they put more heart into them instead of rehashing from their own OCEAN – e.g. homebound. I guess my hope for them doing DEEP KISS again will be lost… that song is one difficult song to sing… you can see from live gym SURVIVE That koshi even had difficulty reaching a clean note on that song back then. I also hope they stop doing brotherhood for awhile…. it has been done too much haha. (4) Calling – FINALLY in High Def!! Well, the reason why I am so sad about this matter is that—from what I have heard yet—Koshi still manages to strike the right notes. Please don’t think of me as a showoff, but since I am so lucky to be equipped with an absolute pitch, I am absolutely convinced of that. It’s rather that the strength of Koshi’s voice evaporates. As I already stated, I think this is nothing unexpected after all those powerful performances he has given for almost 25(!) years. Although I haven’t watched any “C’mon” tour performance completely, it seems to be like before in Los Angeles: In the beginning, you don’t notice any kind of difference, but unfortunately you do as the concert goes on. In the end, Koshi is just hoarse—because he makes himself hoarse and because his voice just cannot bear anymore what it could do in the past years. 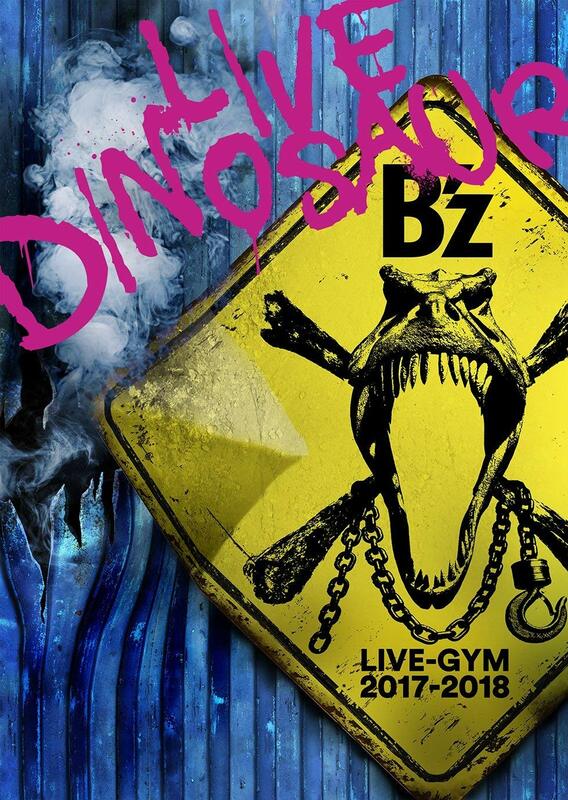 Despite it puts an end to what we love about B’z live performances, I think this is a reason which is much more positive than a general worsening. If Koshi weren’t any longer able to strike the right notes, it would be an extremely sad ending, but this way he simply should assimilate his performance, i.e. : Even though it’s obvious that his body is still in an outstanding condition and that it would be no problem for him to continue jumping across the stage, he should take it easy. While seeing a few seconds of the performances of ZERO and ザ・マイスター, I perceived them as kind of exaggerated anyway, since I saw Koshi jumping around as if he was half his age, but wasn’t able to catch much of the songs’ melodies. It was as if he had touched the notes, but couldn’t really conclude them. Certainly, there are many fans who aren’t bothered about this and merely enjoy the show. At least I, however, am one of the fans who think of the singing itself always as the most relevant aspect about a concert. There are so many artists who simply fail when singing live, and you wonder if it’s the same person as on the sound carriers. Howsoever, perhaps I have only bad thoughts, since I still haven’t watched the whole concert yet. Nevertheless, B’z is my undisputed #1, so this is an issue I am extremely dedicated to, and even philosophizing about it hurts me incredibly. Some very good insights Christian! Well you are perfect pitch so you must be right! 😀 I agree with you that his voice is hoarsing alot more than before now… but i do still give credit to him for trying to stay on top of the game… rock singers are pretty easily prone to “losing it” pretty quickly. For Koshi, it seems to me that he has been using all kinds of proper techniques and postures to try to keep his voice as it is but still i agree with you that he has aged a bit. I also agree with you that they are the undisputed no. 1 to me!!! And yes many people just enjoy concerts nevertheless but since i am a drummer myself, i pay attention to EVERY musician on stage. A slightly off performance of any of them will greatly affect my enjoyment. Of course the vocalist is the most obvious to notice first. So Christian when are you going to get the blu-ray/dvd? You must watch the full concert!! Meanwhile, I’m keeping myself thrilled by searching for single performances, even though they are being removed within 24 hours. I’m still glad to have done so, as performances like “Splash” had a kind of reassuring impact on me. I also got to see “Liar! Liar!,” and, as far as I can judge, this seems to be the decisive performance—while Koshi’s voice is just fine at the beginning, it’s already “slightly damaged” at the end. Unfortunately, I haven’t seen “ZERO” yet, but “DIVE,” where I think you notice that Koshi in a way makes use of “the rest.“ Therefore, it’s extremely hard for me to say this, the singing of “ザ・マイスター” is relatively poor. As I have written before, I could hardly hear Koshi, so that I’m happy that “ザ・マイスター” wasn’t followed by another dynamic song. What I find interesting: The high notes like the “Wooo-ooo-oooh!” of “ザ・マイスター” were no problem at all, although Koshi seems to reach them… let’s say, artificially. To me it appears quite similar to a voice break during puberty. I can remember how I somehow managed to still reach a higher level, which didn’t correspond to my “new” voice, so it “wasn’t real.” But this is, of course, not the same. In spite of all, it’s good to know that—at least so far—the issue we’re philosophizing about is nothing you can’t find a solution to. I think if Koshi just drops a gear, everything will be fine again.